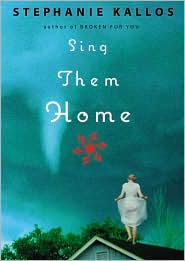 >I’m reading a wonderful novel right now, Sing Them Home by Stephanie Kallos. I picked it up because I loved Kallos’ first novel, Broken For You. Like her first book, this one is a work of true literary fiction, which means it’s not a “quick read,” or at least not for a slow reader like me. I find myself re-reading sentences, just to relish the craft of her art. But I think I would be drawn to her work even if it clipped along at a rate more akin to commercial fiction, because she continues to chose subjects and craft characters that fascinate me. And that I can relate to. Like Larken, the oldest of the three Jones children, whose mother, Hope, disappeared in a tornado in Emlyn Springs, Nebraska, in 1978. Larken is a history professor, who didn’t get parented well in her childhood, which results in her obsession with food and appearance. If you’ve been following my blog, you know my mother didn’t disappear in a tornado when I was a child. But for reasons of her own, she wasn’t able to parent me in a healthy way, or to make up for the emotional absence of my father. What a shame! Hope would say, sotto voice, as she often did when they passed a fat stranger. She has such a pretty face. I’m only 2/3 through the book, and I won’t ruin it by telling you the story line, but instead I’ll jump to the other book on my bedside table, which isn’t a novel. 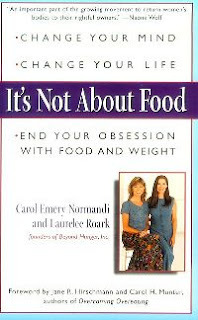 It’s Not About Food: Change Y our Mind, Change Your Life, End Your Obsession with Food and Weight by Carol Emery Normandi and Laurelee Roark, founders of Beyond Hunger, Inc. The book is ten years old, but I just discovered it (a friend shared it with me) recently, and if Larken Jones was a real person instead of a character in a novel I’d send it to her! I didn’t start writing this post to be so much about this journey I’m on to reclaim my body, and my life, but I’ve been struck by the common ground I’ve discovered between the characters in a fiction novel and the stories of real women who are changing their lives through the wisdom of women like Carol Normandi and Laurelee Roark. If none of this interests you, check back with me in a few days and I’ll probably be writing about something completely different! Or even now, actually. Tonight with dinner my husband and I decided to open a bottle of wine that our oldest son, Jon, gave us for Christmas. Jon has much more refined taste in wine than we have, and he loves to introduce us to new wines. Tonight we chose a bottle of “Sin Zin” 2006 Alexander Valley Zinfandel from California. The bottle is intriguing, and Zinfandel from this valley has been described as “a bright, expressive nose, bursting with red fruits and crushed black pepper and a palate loaded with rasberries, strawberries and black pepper.” I couldn’t have written that description myself, but the wine sure was delicious. What brought Jon and his wine to mind tonight was a sobering phone call from him earlier today. Evidently two Kiowa helicopters went down in Iraq today, killing all four pilots on board. They were with a group stationed in New York, where Jon used to be before transferring to the unit stationed in Savannah. Jon hasn’t been able to find out who they were yet, but whether they were acquaintances or close friends from his old unit—either way—the grief is great. He asked for his dad and I to keep them in our thoughts and prayers. So tonight as we gave thanks for our meal, we offered a prayer for these men whose lives have been lost in the service of our country, for healing of our son’s grief, and for his protection as he continues his work as an army helicopter pilot. He’ll be deployed again later this year, and we’ll be listening, again, to every news cast. But tonight we raised our glasses in a toast to Jon, and gave thanks for his safety… and for a very fine bottle of wine.